Low flows in the Sacramento River and Delta lead to deadly water temperatures for Central Valley salmon, steelhead, sturgeon, and smelt, including six state or federally listed endangered species. Water quality standards and operating requirements for the state and federal water projects should include new flow limits to protect fish. 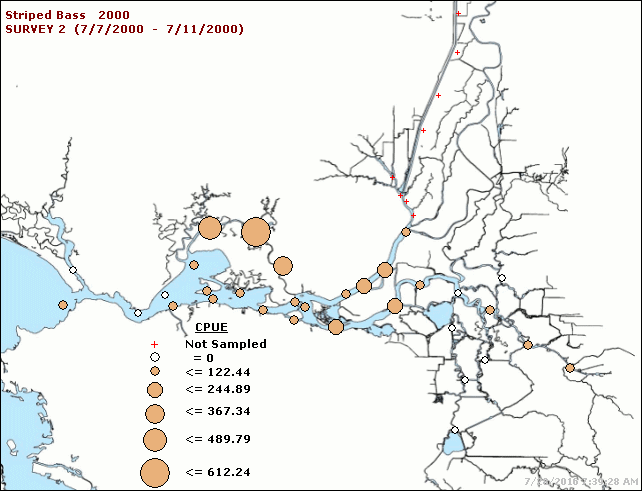 Salmon, steelhead, and sturgeon are subjected to deadly spring and summer water temperatures when lower Sacramento River flows fall below 5000 cfs as measured at Wilkins Slough (Figure 1). Low flows and high water temperatures lead to poor survival and increased predation, and block migrations of adult salmon. Low flows through the lower Sacramento River channel in the Delta also lead to deadly water temperatures for salmon and smelt. When Delta inflow falls below 10,000 cfs, water temperatures become deadly for Delta Smelt (Figure 2) and salmon (Figure 3). Figure 1. Daily average water temperature and river flow in the Sacramento River at Wilkins Slough (RM 125) 2007-2016. Water temperatures greater than 75°F are lethal to salmon and sturgeon, and block salmon migration. The water quality standard for the lower Sacramento River is a limit of 68°F. Temperatures above 68°F are stressful to salmon, sturgeon, and steelhead, and lead to increased risk of predation, lower survival, and poor reproductive success. Figure 2. 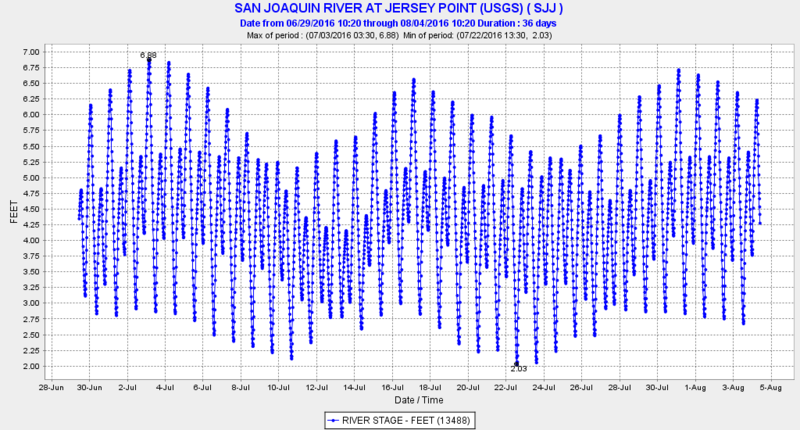 Daily average water temperature and river flow in lower Sacramento River near Freeport. Water temperatures greater than 73°F are lethal to smelt and block salmon migrations. Figure 3. 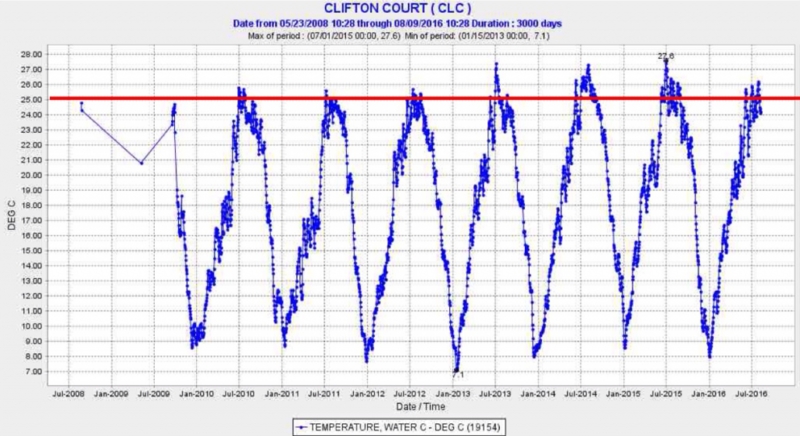 Daily average water temperature in the south Delta at Clifton Court 2009-2016. Water temperatures greater than 25°C (77°F) are lethal to salmon and smelt. The March 29, 2016 Delta smelt symposium, part 4 (“Panel Discussion of the Path Forward”) offered some hope but few specific strategies for Bay-Delta smelt recovery. My own presentation and other presentations earlier in Part 2, focused on how smelt got to the brink of extinction. In Part 4, the panel of experts was asked to offer ways to bring smelt back from the brink. Reading the transcript and watching the video of the discussion, there did not appear to be any specific array of actions or coherent strategy offered by the panel. But on further review, I did find some nuggets that when put together sketch a reasonable course of action. First, though, it is important to point out that over the past two decades there were two episodes that stopped extinction and brought some (albeit modest and short-lived) recovery with the help of Mother Nature. The D-1641 water quality standards and the actions required by the Delta Smelt Biological Opinion actions did help. The symposium should have focused more on those actions that helped, in order to see what further is needed. Admittedly, the fact that recovery episodes were not more frequent makes this difficult. It also does not speak well for 20 years of Bay-Delta adaptive management, which in large measure was a test to see how far the Bay-Delta ecosystem could be stressed by taking more and more water without breaking it. Now that the ecosystem is broken, it is harder to see what helps and what does not. Here is what I assembled from the panel’s discussion as a reasonable strategy to put the smelt and the Bay-Delta ecosystem back on a recovery course again. Simply putting more Sacramento River water down the Bypass might improve the Complex and transfer more of its nutrients, turbidity, and plankton (and smelt) to the north Delta and eastern Bay low salinity zone. Available water sources include the Colusa Basin Drain and Fremont Weir. The large Sacramento River agricultural diversions that feed the Drain are minimally used outside the April-October irrigation season. Present mandates and plans to notch the Fremont Weir would provide a direct source of Sacramento River water to the Bypass. A long-mandated relocation of the North Bay Aqueduct intake from the Cache Slough Complex to the Sacramento River would also help. Mentioned several times as the last refuge of Delta smelt, the Ship Channel from the Port in West Sacramento to the lower end of Cache Slough offers potential in improving conditions for smelt. The closed gate at the upper end of the Ship Channel could be opened at key times to pass Sacramento River water into the upper channel to help flush smelt and nutrients into the north Delta, or simply to enhance smelt survival in the channel itself and in the lower Cache Slough Complex. A panelist suggested dredging the channel. Opening it in summer would cool the channel and possibly the lower Complex because the opening is near the mouth of the American River with its cool outflow. The Panel suggested Increasing nutrients, specifically nitrogen, as a means of boosting plankton productivity and smelt survival in the Delta. Ironically, the Sac Regional Treatment Plant is being forced to reduce its ammonia and nitrogen inputs to the Delta. But the suggestion holds much promise because plankton blooms and turbidity from them are necessary staples of smelt critical habitat. A recent spring plankton bloom coincident with a San Joaquin River flow pulse and low Delta exports suggests one option for increasing nutrients and plankton blooms. Another option is the above-mentioned flow through the Bypass and Ship Channel. Not exporting higher nutrient low salinity zone water is another. Employing the Head of Old River Barrier would force more of the high nutrient San Joaquin water into the Central Delta and away from the south Delta export pumps. Almost everyone on the panel suggested the need for more flow to the Bay to help the smelt. The smelt are simply far better off in wet years. But no one on the panel suggested upgrading the Delta Outflow requirements in the Bay-Delta D-1641 water quality standards, a process that has been ongoing for nearly a decade. Relaxation of the outflow requirements in the past four years of drought proved disastrous for smelt, the kind of adaptive management experiment we could do without. More outflow moves smelt into better habitat in Suisun Bay and Marsh. It also keeps them away from the export pumps, Delta agricultural diversions, and the warmer lower-turbidity confines of the Delta channels with their profusion of warm water competitors and predators. A panel member noted the difficulty of “finding” more water for outflow. The water is there; the need to is export less of it. Several panelists suggested there has been too much emphasis on Delta exports, and that we should be focusing more on other solutions like improving habitats. While physical habitat improvements could help, the fact is that Delta pelagic habitat so essential to smelt and other Delta fishes has been severely degraded by exports (and lower outflows) at an ever increasing rate over the past four decades. Global warming is further adding to the stress. None of the panelists mentioned the benefits of export restrictions in the D-1641 standards or biological opinions. The agricultural community screams to weaken these restrictions, in part from the lack of recognition of their benefits. Several panelists expressed the opinion that the species is protected from extinction by holding them in captivity in two conservation hatcheries. While that may be noble, it is not going to save the Delta or smelt. The option of expansion to production hatcheries was barely discussed, because of an underlying concern of where to put the hatchery fish given the poor existing habitat. But one panelist suggested stocking may be necessary to provide enough natural spawners to allow them to find one another during the spring spawn. Regardless, there are times and places where better habitat occurs such that if more smelt were added, it would benefit the population (e.g., when X2 is downstream of the Delta in the fall). The panel mentioned predators, but only as one of the negative changes that have occurred over the past several decades. The panel discussed habitat enhancements as a means of reducing predators or their access to smelt. There was mention of increasing nutrients to increase phytoplankton food and turbidity, to shade out aquatic plants that shield non-native predator fishes. This holds promise if export operations do not replace good spatial habitat with incoming warm low turbidity river and reservoir water. The panel thankfully did not speak of directly removing Delta predators as a solution to the problem, a suggestion fostered by the ag community. As a group, the strategies mentioned above offer a reasonable short-term solution package to save the Delta smelt. Nearly all the actions can be immediately implemented, or at least started. As a followup to the symposium, I suggest a workshop to develop a plan for such a solution package to guide recovery during the coming years of water battles over the WaterFix (Delta Tunnels), the update of the Bay-Delta Water Quality Control Plan, and the revision of the biological opinions for the long-term operation of the CVP and SWP. In a July 25 post, I wrote of an “unprecedented experiment” that released additional Delta outflow. I wrote that the pulse of Delta outflow in mid-July was in response to the state’s new Delta Smelt Resiliency Strategy July 2016. Well, while the outcome of increased outflow did indeed create a valuable experiment in regard to smelt, the motivation for the release was simply to allow the water projects to be in compliance with State water quality standards for the Delta. 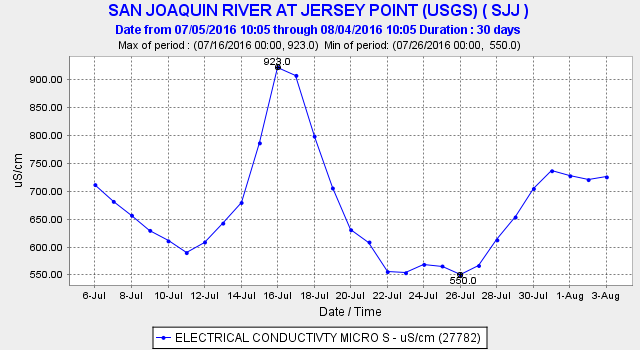 In this Below Normal water year, the required salinity (EC) at Jersey Point in the west Delta must be maintained below 740 EC on a 14-day average. As the average EC crept up in mid-July (Figure 1), the water projects increased outflow (by limiting exports) beginning on July 16 (Figure 2). 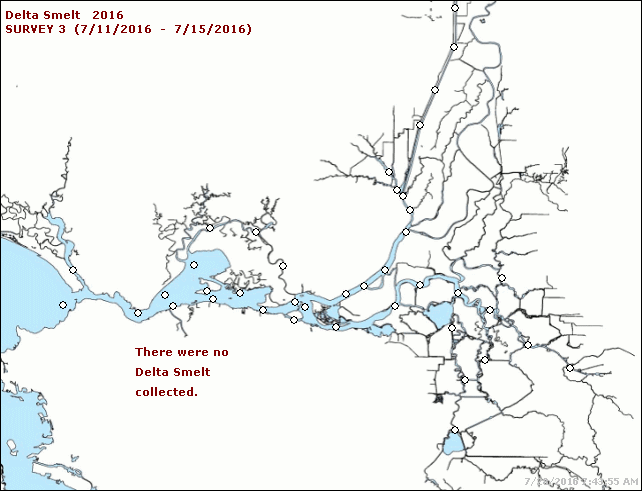 In a July 14 post, I had recommended 9000 cfs Delta outflow for July to keep smelt and the Low Salinity Zone west of the Delta. If the projects had in fact maintained July outflow at 9000 cfs, the standard would have been met and the smelt and their habitat would have been better off for it. A 9000 cfs outflow from July 1-15 would have cost 60,000 AF of water, roughly the cost of the one week of extra water necessary to comply with the standard (the monthly average outflow for July was 8400 cfs). 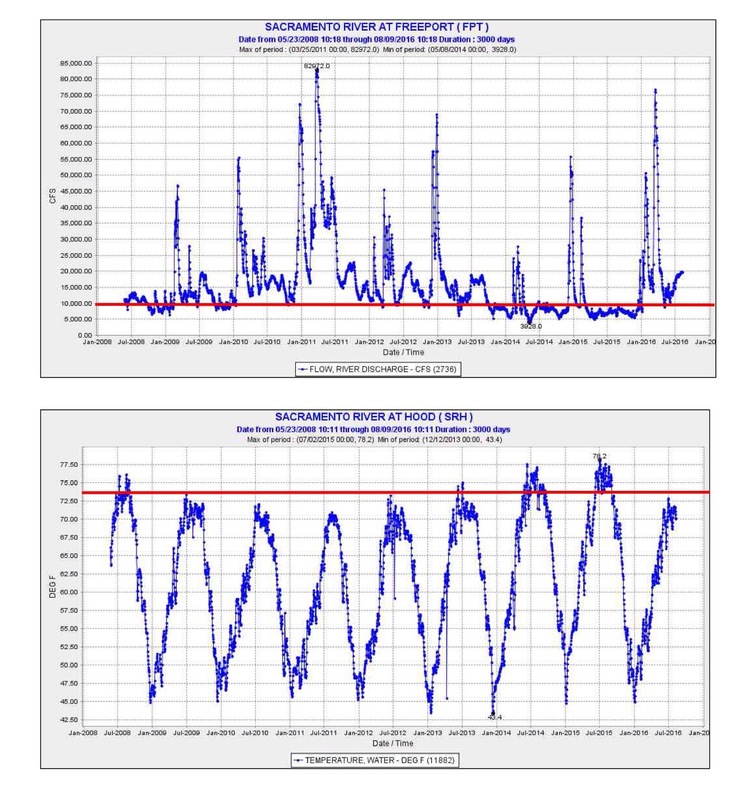 There was significant daily variation in outflow (Figure 2) that caused significant salt penetration into the Delta (Figure 3) with spring tides (Figure 4). Perhaps better control of Delta outflow and salt field on a daily basis would benefit Irrigators (the standard is for agriculture) and reduce effects on fish and their habitat. It also appears that project operators also used more water than was necessary to maintain a consistent 740 EC standard. The extra water could be credited to the Strategy for helping smelt. As it turned out, the event did provide an “unprecedented” adaptive management experiment whose effects bear close examination. If anything, the “experiment” shows that large amounts of water manipulation in the Delta can be accomplished on short notice for whatever purpose. I regret giving credit to the state and federal water projects for attempting to address the new Delta Smelt Strategy, when no such credit was in fact deserved. Perhaps in the future the projects will actually seek credit for managing for Delta smelt, if only for that extra increment of water that assures compliance with water quality standards. Figure 1. 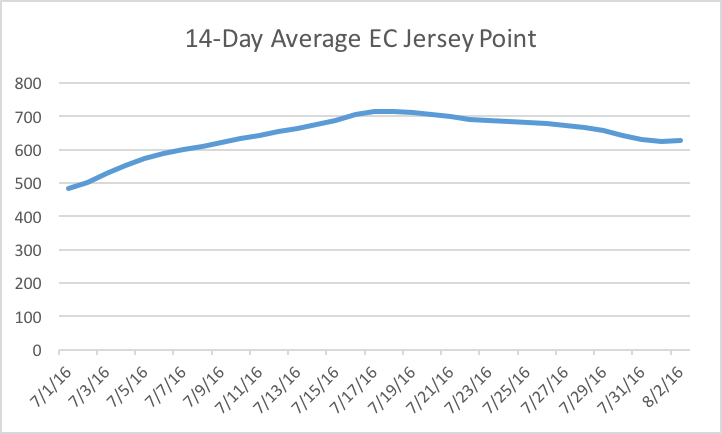 July 14-day average EC at Jersey Point. Figure 2. 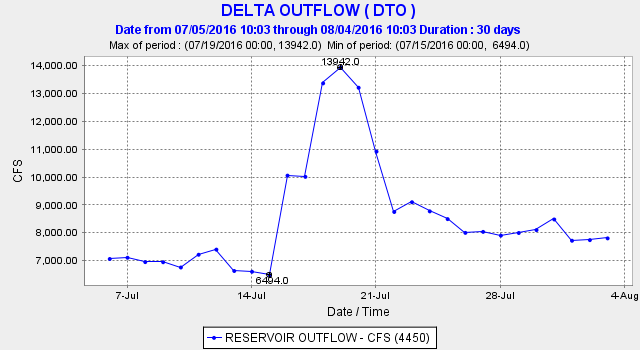 Delta outflow (cfs) over past month. Figure 3. Daily average Salinity EC at Jersey Point over past month. Figure 4. Hourly water level (gage height) at Jersey Point over past month. Since I last posted about splittail, there has been little sign of their recovery in the Bay-Delta. Flooding in the Sacramento Valley brought modest production in 2016, but a dry year in the San Joaquin Valley brought little there. 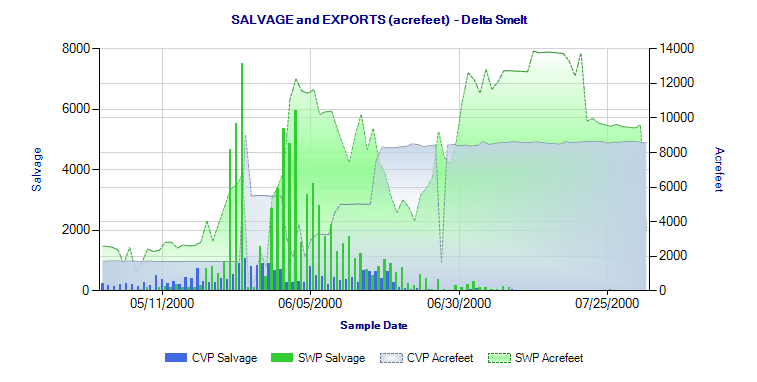 Numbers observed in summer south Delta pumping plant salvage are now very low (chart), with little evidence of recovery of the population. The 2011 year class of 5 year olds, the last good wet-year year class, produced minimal offspring in the past three years. It is fair to say that the recovery potential for the species is improbable. The next several years will be the last for the 2011 year class, leaving the viability of the species in question. As I stated in the earlier post, splittail should not have been removed from the federal list of endangered species. 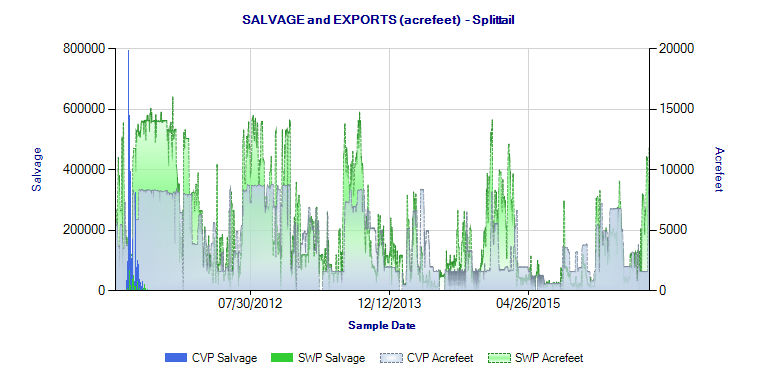 Salvage of Splittail at south Delta export facilities from April 2011 to July 2016. Just a quick update on Delta fisheries on August 1, 2016. Delta outflow this spring-summer for this below-normal water year was as expected, except for the pulse of up to 14,000 cfs in the July experiment to help Delta Smelt (Figure 1). Year 2000, an above-normal year and a pre-Pelagic Organism Decline year, is shown for comparison. Figure 1. 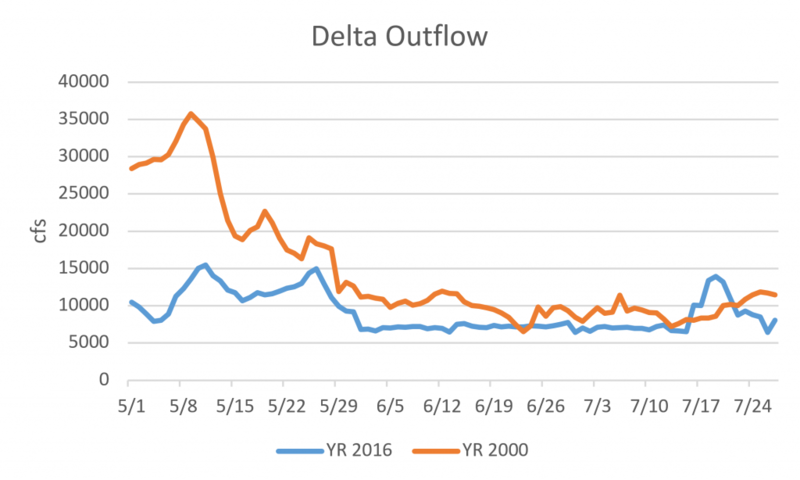 Delta outflow May-July 2000 and 2016. My earlier optimism for this year’s striped bass production continues to fade. 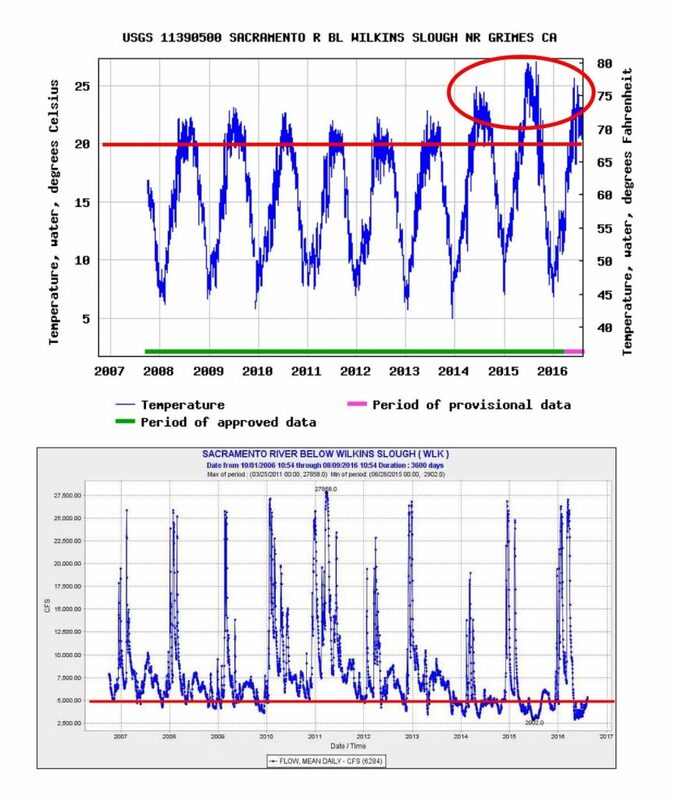 I continue to believe that the poor success is related to poor early summer Delta outflow based on comparison with year 2000, the last decent year class produced by striped bass in the Bay-Delta as determined by the June Summer Townet Survey. Figures 2 and 3 show abundance and distribution in 2000 and 2016, respectively. Densities were an order of magnitude higher in 2000, after spring larvae abundances were similar between the two years. 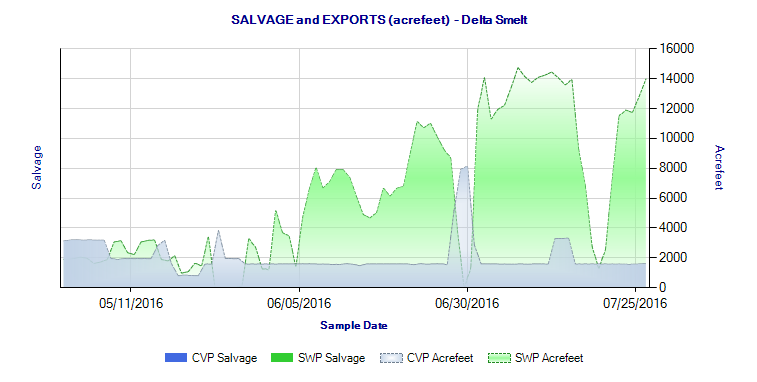 Figures 4 and 5 show spring-summer salvage at south Delta pumps for 2000 and 2016, respectively. Again, much higher salvage in 2000 reflects the order of magnitude greater abundance in 2000 than in 2016. Delta Smelt continue to be virtually extinct in the Bay-Delta. Figures 6 and 7 show abundance and distribution in 2000, the last near normal abundance year (pre-Pelagic Organism Decline), and 2016, respectively. Figures 8 and 9 show spring-summer salvage at south Delta pumps for 2000 and 2016, respectively. The relatively high salvage in 2000 reflects the general abundance at the end of the 90’s. The fact that there are no longer Delta Smelt in the 2016 Townet Survey or in salvage is a very clear indication that Delta Smelt are virtually extinct. The July experiment, though well intended, was a little too late. Figure 2. 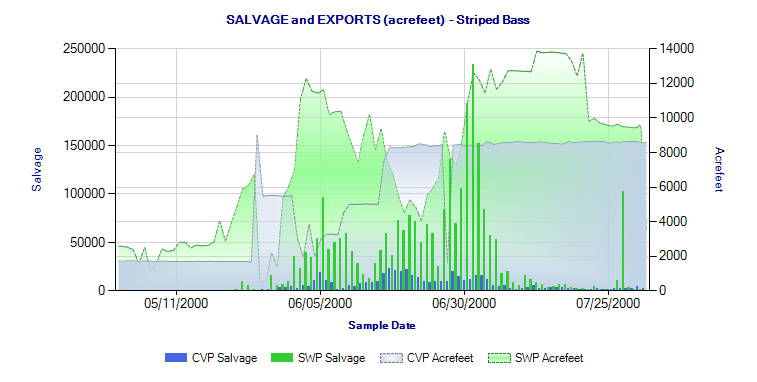 Striped Bass catch per 10,000 cubic meters in June 2000. Figure 3. Striped Bass catch per 10,000 cubic meters in June 2016. Figure 4. South Delta salvage of Striped Bass May-July 2000. Figure 5. 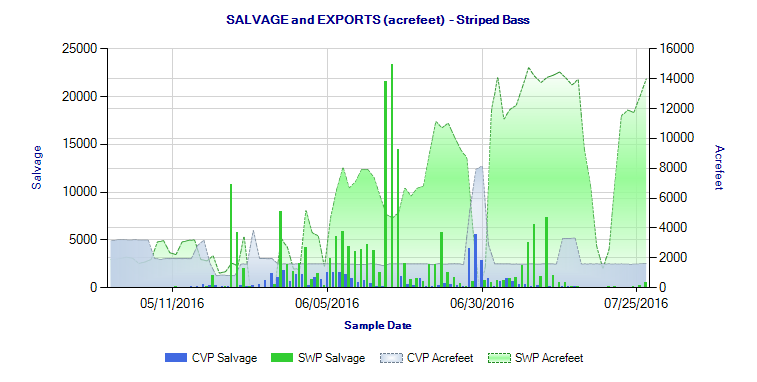 South Delta salvage of Striped Bass May-July 2016. Figure 6. Delta Smelt catch per 10,000 cubic meters in June 2000. Figure 7. Delta Smelt catch per 10,000 cubic meters in June 2016. Figure 8. South Delta salvage of Delta Smelt May-July 2000.